Astronomers Seeking Planet 9 Hope To Soon Catch A Glimpse : The Two-Way Scientists will search the sky Thursday for an undiscovered planet in the outer solar system — they're pretty sure it's out there, and computer models tell them where to look. 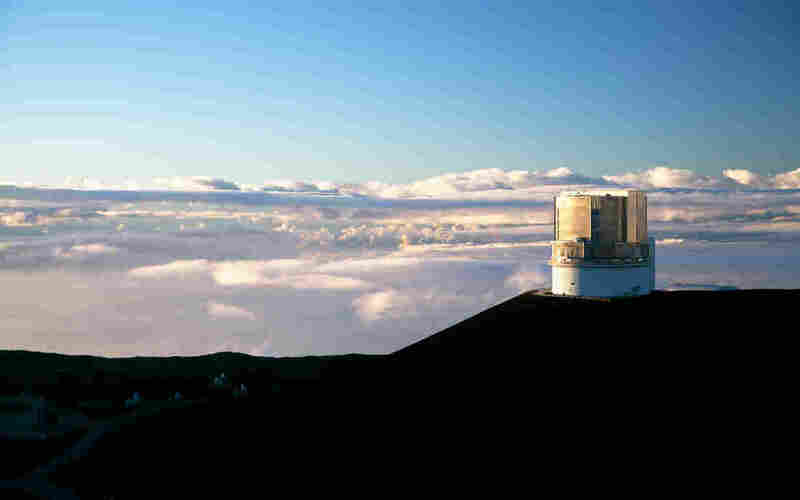 Astronomers searching for an undiscovered planet in the outer solar system hope to catch a glimpse of it Thursday through the Subaru Telescope located on top of Hawaii's Mauna Kea mountain. On the top of Hawaii's Mauna Kea mountain Thursday, astronomers will point the large Subaru Telescope toward a patch of sky near the constellation of Orion, looking for an extremely faint object moving slowly through space. If they find what they're looking for, it will be one of the most important astronomical discoveries in more than a century: a new planet in our solar system. Technically, a new planet hasn't been discovered since Neptune was spotted in 1846. Pluto, discovered in 1930, was demoted to "dwarf planet" a decade ago. If a new planet is found, it will be the new Planet Nine. Scott Sheppard of the Carnegie Institution for Science in Washington, D.C., will be among the astronomers poring over the pictures taken by Subaru to see if one provides a glimpse of the planet. Sheppard and others have been studying photos taken earlier this year by the Subaru. "We're looking for things that move, so we're looking for anything that's not a star or a galaxy, basically," Sheppard says. Things that move are most likely objects orbiting our sun, dim objects in the far reaches of the solar system — way past the orbit of Neptune. Sheppard has been using telescopes in Hawaii and Chile to search for these distant objects, and has found several of them. "All of the objects are right on the edge of detection," he says. "They're very faint." But so far, no new planet. In 2014, Sheppard and a colleague published a paper suggesting a handful of these faint distant objects were behaving as if something even more distant with a strong gravitational pull was tugging on them. They suggested the behavior might be explained by an undiscovered planet. That speculation got a boost from a computer model developed by two other astronomers at Caltech. The model confirmed, at least theoretically, that the planet was really there, and predicted it would be 10 times more massive than Earth, and could even explain the sun's slight tilt with respect to the rest of the solar system. But astronomer David Jewitt, at the University of California, Los Angeles, thinks it's wrong to get all hot and bothered about a new planet at this point. Jewitt says the model is interesting work, "but without meaning to sound too critical, it's relatively easy to explain anything that's observed, in one way or another, using a model." He also thinks the media attention to the model is overblown. "There's the natural tendency to jump on reports of 'Hey, we've got a planet, we might have a planet.' That's something that people really want to think about a lot. It's a very cool thing to think about," says Jewitt. He adds that theories and models do have value, but they only take you so far. "The answer as to whether there's another planet won't come from models. It won't come from theories. It will only come from observations," Jewitt says. And so several astronomers, including Sheppard, are out there observing. "To me this is science at its finest," says Sheppard. "It's like this thing where science is leading us to say something is definitely going on out there, something weird is happening, and the best explanation for it is there's a planet."